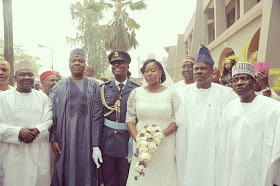 The daughter of John Odigie-Oyegun, the National Chairman of the All Progressives Congress (APC), Eniyemamwen Oyegun, married her lover Umaso Eketu a Nigerian Air Force officer on Saturday in Lagos. 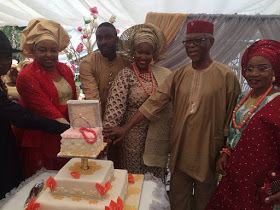 The union of Eniyemamwen and Umaso took place at the Archbishop Vining Memorial Church Cathedral in Lagos and the reception was held at the Haven‎ Event Centre also in Lagos. Others dignitaries and attendees at the wedding included: Minister of Information and Culture-Lai Mohammed‎, Minister of Science and Technology-Ogbonnaya Onu‎, Interior minister-‎Abdulrahman Dambazau was‎ represented by Assistant Inspector-General of Police (Zone 2) Bala Hassan, FCT Minister-Muhammed Musa Bello was represented by FCTA Director of Information-Stella Ojeme. 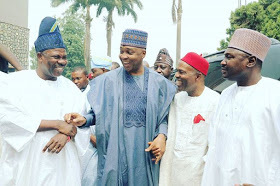 Senate Majority Leader-Ali Ndume, Chairman, Senate Committee on Federal Capital Territory-Senator Dino Melaye, Deputy Governor of Nasarawa State-Silas Ali Agara, Edo State Deputy Governor-Pius Odubu, Akwa Ibom APC governorship candidate-Umana Okon Umana, Edo State governorship aspirant-Charles Airhiavbere‎, and APC’s Director of Administration- Abdullahi Gashua‎. National Secretary- Mai Mala Buni, National Treasurer-Bala Gwagwaruwa, National Woman Leader-Ramatu Tijani,‎ Deputy National Chairman South-Segun Oni, Vice Chairman North West-Inuwa Abdulkadir, National Organizing Secretary-Osita Izunaso, and Zonal Woman Leader (South West) Kemi Nelson. ‎Former Edo State Governor-Oserheimen Osunbor‎, former Governor of old Anambra State-Jim Nwobodo, ‎former Deputy Speaker of the House of Representatives-Chibudom ‎Nwuche‎, APC‎ Anambra Central Senatorial candidate-Sharon Ikeazor, former Governor of Ogun State-Olusegun Osoba;‎ and former Governor of Ekiti State-Niyi ‎Adebayo‎‎.